One favorite story in the Bible is Jesus calling his first disciples along the Sea of Galilee. Unfortunately, when Jesus called James, John, Peter, and Andrew to a life of ministry, he called them away from their business partner Zebedee. Zebedee, a first-century fisherman, devoted Jew, and entrepreneur, watched his partners choose to walk away from their business obligations and follow Jesus to become fishers of men. 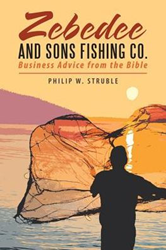 “Zebedee and Sons Fishing Co.” looks at the 21st-century business world through Zebedee’s eyes and demonstrates that the biblical knowledge from the first-century is applicable to today’s business world. Philip Struble has been the president of Landplan Engineering since 1995. This multi-disciplined, urban engineering company has offices in three states and development projects spanning the country. Struble graduated from the University of Kansas with a degree in civil engineering and an MBA. To follow Christ, he later returned to school to earn his Masters of Theology. Struble and his wife, Stephanie, have four adult children and currently reside on a small farm in rural Douglas County, Kansas. Mowing grass, golfing, guitar, and snow skiing are a few of the hobbies that occupy his time when not working or writing. To learn more, please visit http://www.zebedeeandsonsfishingco.com.